PTC LiveWorx Europe is coming near and if you haven't registered yet, I want to give you another reason to do so. 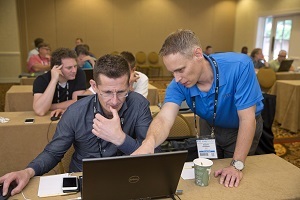 With this new, comprehensive event format, you will get access to inspiring sessions, case studies and training that will allow you to harness the full potential of PTC products and Internet of Things technology. In short: An exciting program is waiting for you to take you to the world of smart, connected products. If you haven't had a chance yet to explore the world of IoT, we would like to recommend you our IoT training classes on Monday, November 16. We are offering two sessions as an add-on to the event's agenda. So if you are already considering to travel to Stuttgart, consider arriving a day early to attend a class! This session will provide an overview of ThingWorx and how it can be leverage to build and realize powerful smart connected products and Internet of Things (IoT) applications. We will discuss important concepts and terminology. Participants will walk through a business scenario of a rental car company and learn how a Thingworx-based IoT application can be used to solve business challenges and benefit the end user. We are running this class twice, so you can pick the slot that is most convenient for you. These training sessions are specifically targeted to newcomers to the IoT world (non-technical and technical individuals new to IoT), and will introduce them to the concepts of ThingWorx. With these new skills, they will be able to more deeply benefit from the other sessions on the event’s agenda and be able to have a well-rounded conference experience. To complete any of the hands-on activities, participants are asked to bring their own laptops. Both classes are held in English. Price for a 4-hour training is 210,- EUR per person. >> To request a quote and make a reservation, please fill out this form. Our training advisors will be happy to answer your questions.